Have you ever considered what a text would look like without punctuation? In what way would an author ensure that they successfully conveyed the appropriate meaning to their audience and how would the audience identify meaningful units, or senses, within a text? Punctuation is, and always has been, a useful way of dividing text into smaller units of meaning, dispelling ambiguity and developing a specific meaning. In approaching text as a model of information it is important to consider not only how information was encoded but also how it was decoded – a process in which punctuation has been, and continues to be, a powerful tool. Franks Casket, front panel. Image: British Museum. Vespasian Psalter, British Library MS Cotton Vespasian A.1, fol. 24r (detail). Image: British Library. These four documents all include English text in some form, and all date from the eighth century. The first, the front panel of the Franks Casket, features an Old English riddle in runes. The second, the Corpus Glossary, provides meanings of Latin terms in Latin and sometimes in Old English. The third, the Vespasian Psalter, gives an interlinear Old English gloss on the Latin text of the Psalms. 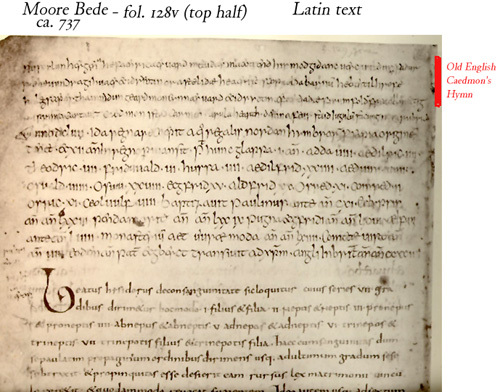 And the fourth, a copy of Bede’s Historia ecclesiastica, includes the Old English text of Cædmon’s Hymn as an annotation to the Latin text. All these documents provide graphic evidence of the way early English writers thought of their language as being divisible into word units. The technology that emerged to meet those needs – writing – filled a prosaic but essential purpose: accounting. The impetus behind its invention was not a desire to faithfully record language, but to record trade transactions, crop yields, and taxes – to record and preserve information, not language.